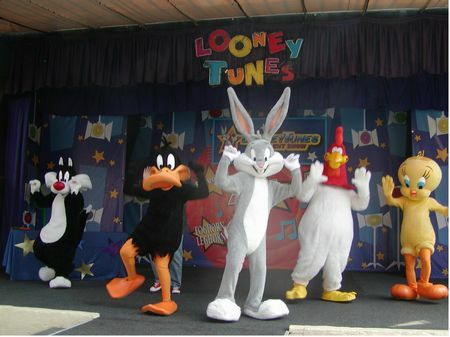 Bugs Bunny Boomtown is a playground in Bugs Bunny Boomtown at Six Flags Over Georgia. It's worth seeing on a time-permitting basis. A section of the park set aside for small children. This area is filled with carnival style kiddie rides and tame midway attractions including: ACME Trucking Company (kiddie truck ride), Bugs Bunny High Sea Adventure (swing ride), Daffy Duck Bucket Blasters (spinning flat ride), Looney Tunes Adventure Camp (playground), Speedy Gonzales Speed Boats (spinning flat ride), Tweety Treehouse (kiddie drop tower), Yosemite Sam Wacky Wagons (mini Ferris wheel), and Bugs Bunny Theater.